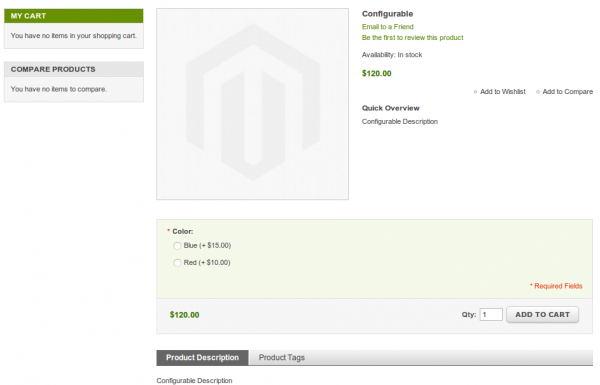 In this article, I’ll give you extension that will change drop down selection (select field) to radio buttons on configurable products in Magento Community edition. Well, what I had to do is rewrite Mage_Catalog_Block_Product_View_Type_Configurable block, and create a custom phtml file (configurable.phtml) with some custom validation on it. And block rewrite consisted of addition of new method “getRegularConfig” that corresponds to “getJsonConfig”, except it doesn’t return Json encoded data. And custom template packed in attached zip file is located under “test” theme folder. For installation you need to extract both layout (configurable.xml) and phtml (configurable.phtml) files. And finally, you can download it here. I’ve installed this extension and it’s working great! I was even able to customize it to display the actual simple product price rather than the plus or minus difference from the base price. Where I’m running into an issue is setting the sort order. This doesn’t appear to be looking at the Product Attribute Options “Order” and is just sorting by the simple product sku. Is there any way to set the “order” of the attribute options and have that order be reflected in the options? Any help would be greatly appreciated. Hi, How do I auto-select the first option as default? <input type="radio" name="super_attribute[<?php echo $_attribute->getAttributeId() ?>]"
I found another hints to price building in comments, but do not know, how to make them work correct. The Problem is now, when i click the first radio button, the price updates correct, when i click in second row on another radio button, the price is not added, it is overritten. Your module is great ! Thank you so much. The only thing is I don’t get the right currency symbol. I want to display € in the radio button area. I have copied files from app/design/frontend/default test to my custome theme but nothing change on frontend. Does anyone could help me please ? Is it necessary to copy Inchoo folder in app/code/local ? What about displaying configurable product just in a table including all children products? But I wonder that whether i can use code for this kind of display or not? 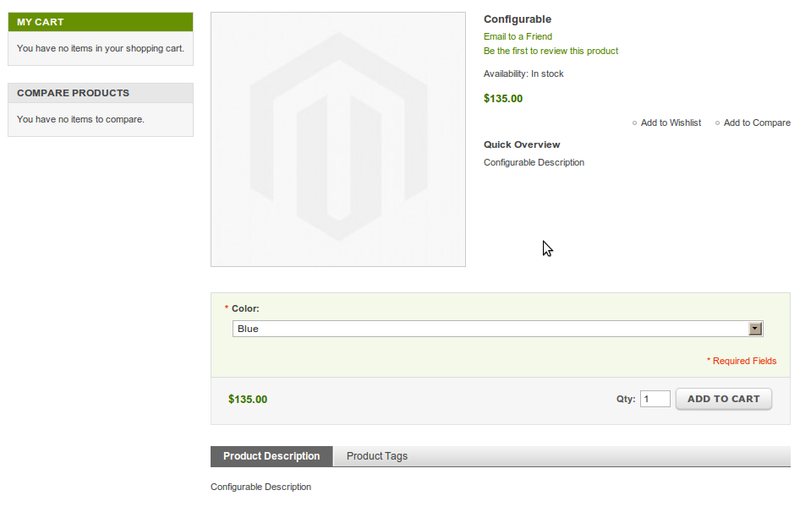 Great extension, but it seemed to break the configurable swatches function in Magento 1.9. When selecting an option on a configurable product (i.e. Color), I can’t get the main product image to change. Does anyone know a fix for this? In configurable.phtml the code for displaying attribute options is altready part of an attribute loop, however the function getRegularConfig() returns all attributes. Using this extension, having one problem regarding price. On product view page it shows only regular price for all additional products. Additional price is not displaying. Please reply ASAP. Could you explain how to use this zip folder as am beginner to magento and want to make configurable product attribute size into a radio button instead of dropdown. any help will be appreciable & waiting for your response. This code is great ! Thank you so much. If not. Do you have a solution for that ? if anyone knows any way to change the images based on one of the attributes? Any solution for multiple attributes ? I have tried the above solution (comparing the label which I changed to attribute ID as it made more sense to me) but it still shows ALL available options of this attribute, not only the ones, that my product offers. Is there a satisfying solution for multiple attributes yet? Otherwise great extension! Love it! Great work with this plugin! Thank you very much it works like a charm! 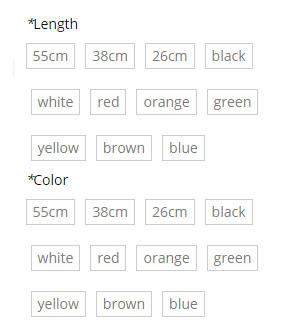 But can I ask you how can I get the simple product attributes to show on each option. For example I want to add the simple product Image next to the radio button. When using with multiple attributes every attribute gets all options. Just figured out how to fix it when working with multiple currencies. It does not work with multiple currencies, right? In the cart the total is right, but in the products page when you choose an option, the total is wrong. If I find the fix I will post here. does any body have the solution for it. Thanks for this extension. I see that the prices are not updated. Could you please tell me how i can fix this? image configuration product error? http://i1195.photobucket.com/albums/aa396/krites007/1a.gif How to edit it? Please teach me. please. so is there any type of plugin available? Unfortunately it does not work with special prices. I saw in configurable.php that it gets the special price by ->getFinalPrice but on the frontend it always displays the regular price.